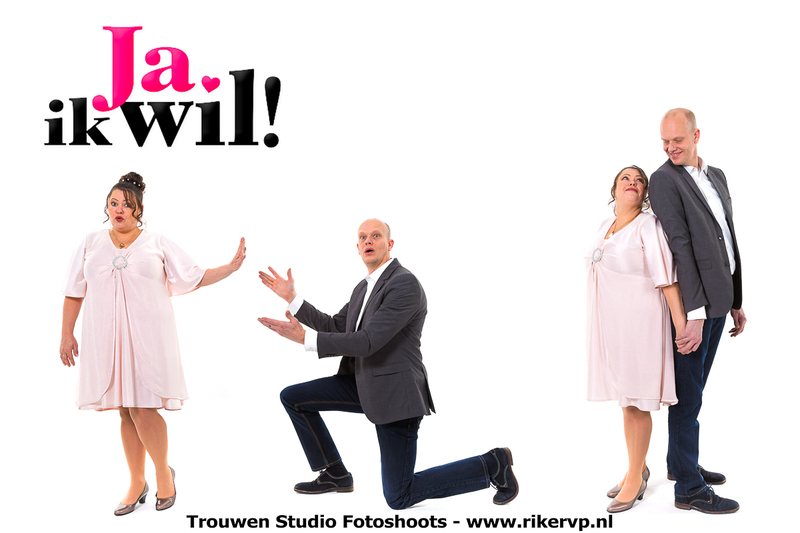 It’s not everyday I shoot wedding foto’s in studio, but once in awhile I get a call for it. This particular shoot was referred to me from through my great photographer friend Elisabeth Connie Rozenberg of diadame.nl . I’ve know her a long time and she is also an accomplished photographer in her own right. We have always both respected each other in what we do and have even collectively worked together on a creative shoot sharing styles and knowledge. A lot of photographers in my area are more like good business colleagues rather than fierce competition. We here mostly work together to give all potential clients the best advice and service even if we can not do the work ourselves. A lot of us sometimes refer business to each other helps each other out from time to time and that is good thing !. I think if your in the Rotterdam area you really should check Connie Rozenberg of diadame.nl out ! On this particular day I shot a beautiful woman named Monique and her handsome husband Olaf. These two were such fun to shoot with bringing a lot of humor and laughs. Not every newly married couple or couples marrying for the second time go for the big expense of a huge romantically themed wedding and a lot of people here in Holland just go to City Hall because everything goes through City Hall here. Some people do the the big western “North American style” church weddings but they also have someone official from City Hall do the official marriage ceremony first, to make it all legal in the eyes of the Dutch officials. While shooting in the studio does limit ones option to include the mood of an on location wedding shoot, one therefore must concentrate on the personalities of the couple. This is where having a little bit of fun with the newly married couple can really pay off for them, capturing the sweet side of them, the romantic side or just the fun side of them. Capturing the love and fun is equally important as capturing them in the right lighting and exposure. I like to shoot on a white background for the bright shots where lighting in my studio is all around. I also like shooting on a plain black background for the more intimate and dramatic shots that focus more closely on the couple’s faces and interactions between the two. Facial expressions can really change how a viewer looks at the foto image. I really like it when people bring on those facial expression, really makes for some interesting and fun foto’s. But by the same token, there is also the serious side of capturing the essence and love between the married couple. Not forgetting to get as many detail foto as well, like shoes, dress details and nice foto of the rings. An important detail any wedding photographer should be doing as part of any wedding.